The current draft solicitation, which was issued June 21, 2018, is asking industry for proposals for a spaceflight demonstration of a PPE for LOP-G. NASA is asking for designs to include a high-power, 50-kilowatt solar electric propulsion spacecraft that will be used to both maintain the gateway’s position in a near-rectilinear halo orbit around the Moon, but to also to move it into different orbits as required for other mission applications. According to NASA, the PPE will enable high-rate, reliable communications between Earth and deep space, which could be important for spacewalking astronauts as well as astronauts working on the lunar surface. Whoever is selected to partner with the U.S. space agency on this first element will need to design and build a power and propulsion spacecraft and have it function for a full year in space for testing. NASA said the BAA includes the option to acquire the spacecraft to use it for the first element of the gateway. After hosting an industry day on July 10, 2018, NASA will issue a final BAA. Per the draft, the agency and its selected partner, or partners, are expected to begin the project upon the contract award, which is currently aiming for March 2019, and conclude some 24 months after a successful spaceflight demonstration. In order to keep on track with the development of the gateway, NASA is targeting the launch of the PPE atop a commercial launch vehicle no later than September 2022. What has happened to the idea of using the Bigelow expandable. Much more room for less money?????. The “high-power, 50-kilowatt solar electric propulsion” with a high Isp means the PPE, that can be resupplied with propellant in orbit, is a highly efficient reusable space tug for moving large payloads around in Cislunar Space. Once we start mining the Moon, our high Isp electric propulsion space tugs should be capable of efficiently getting material from a low Lunar orbit to a geosynchronous orbit 22,236 miles, or 35,786 kilometers, above Earth to build massive 10,000 metric ton commercial Solar Power Satellites with 1-gigawatt of power. Galactic cosmic radiation is one of the nasty and restless elephants hiding ‘under the rug’ for long duration deep space missions that will not be partially shielded by either our Moon or the Earth’s bulk and its magnetic field. Currently, long duration deep space missions might need about 1 to 2+ meters of aluminum for thick and somewhat effective galactic cosmic radiation shielding which obviously is a high mass that would be super costly to accelerate with our currently available space propulsion technology. Less shielding = shorter doable deep space missions. Why are the very efficient and high 2,800 to 14,000+ Isp solar electric space propulsion systems important for the power and propulsion element, or PPE, of the Lunar Orbital Platform-Gateway and space tugs and much of what we expect to be doable in Cislunar Space to help mine and colonize the Moon? Why are highly efficient nuclear powered electric space propulsion systems important for our future human and robot exploration and mining missions to Ceres, Mars, Enceladus, Titan, and Pluto? In a risk minimized, sustainable, flexible, and cost effective manner we need to repeatedly get people, robots, and cargo on the Moon to build a permanent resource exploration and mining base as the near-term main goal of our upcoming international and commercial Lunar missions. The cost effective high Isp solar electric propulsion system enables efficient mobility of the Gateway to new orbits and should contribute to the critical safety of future Lunar missions. An eventual stable low Lunar frozen polar orbit for the Gateway is within its solar electric propulsion system’s capability. 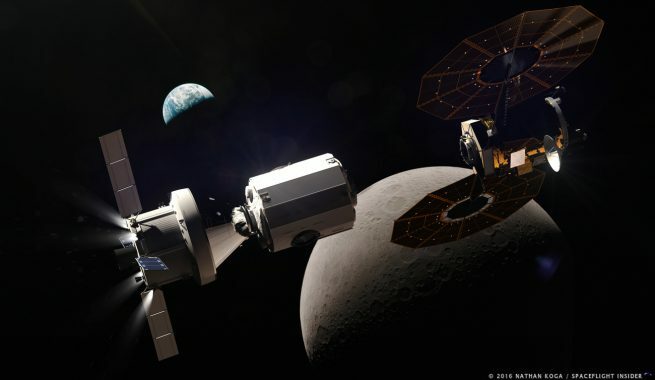 Could future PPE based reusable space tugs with efficient high Isp 50-kilowatt, or larger and more powerful, solar electric propulsion systems be eventually used to cost effectively move some of the newer modules of the International Space Station in LEO to the Lunar Orbital Platform — Gateway (LOP-G) in its initial 1,200 miles low to 47,000 miles high egg-shaped polar Lunar orbit? 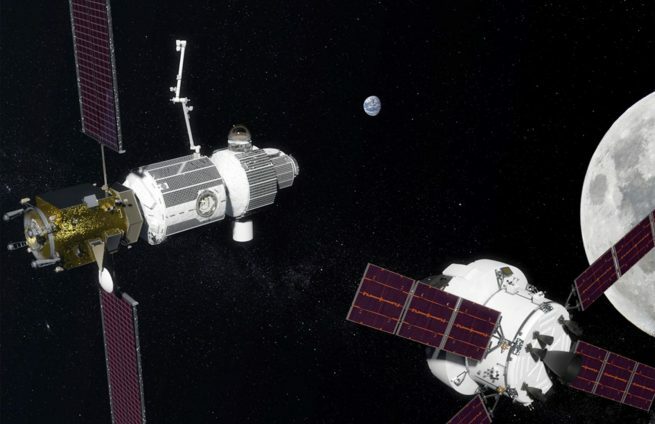 Could reusable high Isp solar electric propulsion based space tugs also be used to move the noted upcoming new Russian modules from LEO to the Gateway?